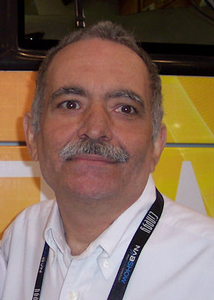 Bill Sacks is an SBE board Certified Professional Broadcast Engineer who has designed dozens of broadcast audio products. He has worked in broadcast and live sound for nearly forty years. He was Chief Engineer of radio stations WYRE,WHFS and WWDC in his early career. He then founded Straight Wire Audio in 1979 and designed all of their preamplifiers including phono preamps still in everyday use. Bill was the original audio editor for Radio World Newspaper and wrote extensively for them in the 1980's on proper audio practices for broadcasting. He wrote chapter 7.2 " Using Operational Amplifiers in Broadcasting" for the 50th anniversary and 7th edition of the NAB Broadcast Engineering Handbook. He served as Chapter Chairman of SBE 37, Washington DC for many years. And he was a contributing member of the NAB/EIA BTSC MTS committee which developed the standard for analog stereo television broadcasting. Bill is Chair of AES SC 05-05 where he helps develop uniform standards for professional audio interfaces. He was Director of Research and Development for Maryland Sound Industries in the late 80's and early 90's; where he developed new methods of in-ear monitoring for live sound. Bill is the sole inventor and patent holder (US 5,355,416) for the pioneering wireless in ear stage monitor system originally used by artists such as Stevie Wonder, Luther Vandross, Roberta Flack, Celine Dion, Axl Rose, and many other early adopters of in ear fold back monitoring. His in ear monitor system was nominated for the1992 Mix Outstanding Technical Achievement, Sound Reinforcement Product of The Year TEC Award. Bill and his wife Kim have collaborated to design many of Henry Engineering's digital broadcast products, winning 6 Radio World "Cool Stuff" awards, including the USB Matchbox. Bill is designing a modern version of the Straight Wire Audio Phono Preamp. Bill serves as Analog Engineer at Orban supporting analog legacy products and developing presets for current DSP Optimod processors. He and his wife, Kim Sacks also provide a factory-authorized refurbishing and restoration service,www.optimod.fm, for legacy analog Orban studio and Optimod products, improving them with modern op amps and capacitors.